You probably know all about Space. It’s been on television and in every other movie. But at next Wednesday’s Rotary meeting, you will meet two people have actual photographs of Space—in color and digitally autographed. Astronomer Linda Sinkay embraced her passion for the night sky as a young girl camping with her family, charmed by the mythology of the constellations and fascinated by stories of Perseus & Andromeda. 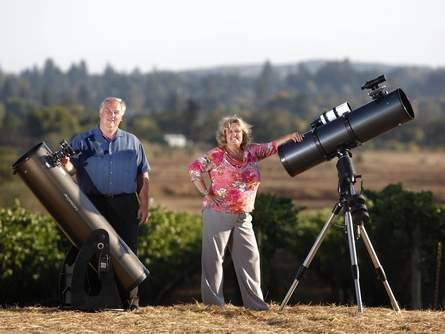 Jim Goodenough is also an astronomer and both Linda & Jim are Docents at the Robert Ferguson Observatory – not to mention Past Presidents of the Rotary Club of Sebastopol Sunrise. Fasten your seat belts next week…you’re in for a ride among the stars! Mike Truesdell led us in The Pledge to our Flag, en Français, followed by the Group Study Exchange Team singing the French National Anthem, La Marseillaise. Chip Rawson concluded the ceremonies with the reading of a favorite quotation by author C .S. Lewis as the invocation. 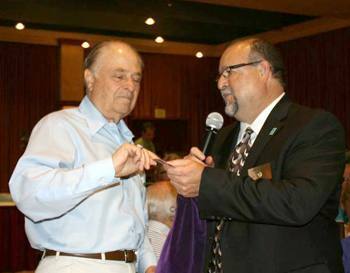 A former member of this Rotary Club and resident of Santa Rosa, David Del Monte, Past President of the Rotary Club of New York and District Governor Elect for greater New York’s District 7230. Also visiting, Julie Nation from Santa Rosa West, Sue Bisbee from Santa Rosa East, and Past Governor of District 5130 Maureen Merrill, from the Rotary Club of Windsor. Rotary Foundation Scholarship recipient Therese Brown and her mother Rebecca Brown; Rob Kirby and our own Jerry Marquis plus second guest of Dave Del Monte. (I heard a few people asking when Jerry was going to come back home and rejoin). As The Santa Rosarian goes to distribution, we are informed of the passing of Evelyn Farrell, the wife of long-time Rotarian Tom Farrell, who joined this Rotary Club in 1969 and remains a member of Sebastopol Rotary after 44 years as a Rotarian. Evelyn celebrated her 85th birthday earlier this month. She and Tom were married in 1950. Services are pending. Jose Guillen, who continues to monitor Raffle conditions, immediately informed us that there were only 51 playing cards remaining in the velvet bag, and the Raffle Jackpot had grown to $125. Past President Yale Abrams’ number was drawn and revealed to us by one of our French guests, but alas, he drew that 51st card—the Deuce of Spades—and seemed to be content with his $10 consolation prize. Scholarship Chair Steve Olson explained three weeks ago that awarding the Rotary Foundation Academic Scholarship during final exams is always a logistical challenge. Which explains why our scholarship awards started on May 15th and concludes with one final recipient on May 29. Past president Steve introduced us to Therese Brown, a graduate of Pathways Charter School in Rohnert Park, with a 4.0 Grade Point Average at Santa Rosa Junior College. A talented violinist, she will be attending UC Santa Barbara in the fall, majoring in music, plus she plans to continue her education in graduate school. 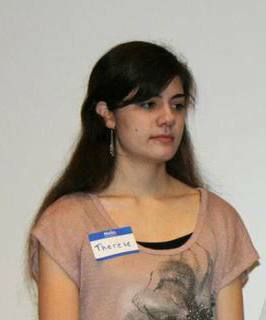 Therese received the Rotary Club of Santa Rosa Trustee Scholarship in the amount of $1500, concluding the year’s presentations of the ten annual scholarships for 2013. Past President Steve Olson received the annual Presidential Medal of Honor from SRJC President Frank Chong for his long service as dean and faculty member of the school’s agriculture program. Steve attended SRJC as a student and returned in 1970 as one of the earliest faculty members. He helped establish Shone Farm, the college’s working farm near Forestville. 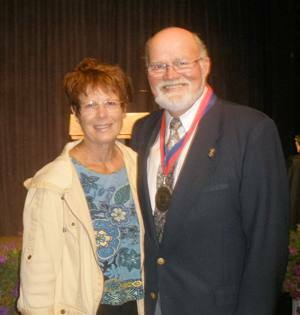 After retiring in 2007, Steve still remains active at the college and in the community as a member of this Rotary Club. 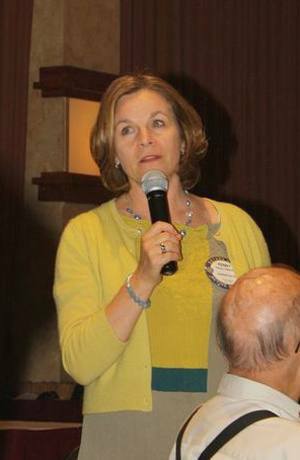 President William reminded us again that Rotary’s Annual District Conference is this weekend at the Hyatt Vineyard Creek Hotel & Spa in Santa Rosa. If you can make it for any of the events, please come. You can find the conference schedule in last week’s Santa Rosarian or on the District website. 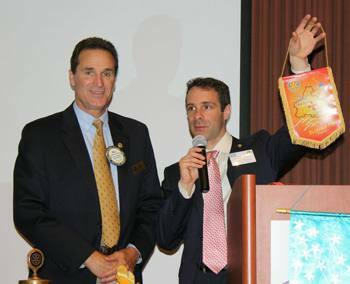 On Monday afternoon, District Governor Michael Juric will meet with the Rotary Club’s board of Directors. Anyone who wants to attend and be part of the discussion about upcoming increase in club dues are welcome to attend the special meeting, starting at 5 pm in the Salvation Army Conference Room, 93 Stoney Circle. Jackie & Don McMillan announced that Giro Bello needs some pop-up canopies to join our new blue and gold Rotary Club tent, helping promote the Third Annual Giro Bello between now and July 7th. If you have one to lend, please let them know immediately. Also, if you have not signed up to help on the Giro Bello, the committee really needs your help on both Friday & Saturday, July 5th and 6th. As we mentioned last week, the Giro Bello is the largest and most productive “hands on” project of Rotary’s last three years. Volunteer now to help where you are needed most, contact Matt Fannin, Don McMillan, Layne Bowen, Carmen Sinigiani, Diane Moresi, or any member of the board. They are all listed in the club roster and online at http://www.santarosarotary.com. President Bill tried to fine Matt Everson for skipping last week’s meeting and going to the Giant’s game instead. Matt let President Bill know in no uncertain terms that he had already paid for skipping the Rotary meeting to see the game. Then admitted that he planned to miss next week’s meeting to go to a Giant’s game. This set off a chain reaction. It turns out that Gary Vice and Jack Tolin went to that 49er game with Matt! All three truants donated $5.00 each to the club. But Steve Reuter coughed up $15 after being inspired to admit that he was at the game too, but not with Matt, Gary, and Jack. Past President Wally Lowry confessed that he had driven to his grandson’s graduation from Chico State, all the way to Chico and back, without his wallet or his driver license. Even with no cash, Wally made it back safely. I guess you could say he “made it under the radar”? Except for his $15 confession charge. Karen Ball for making to a Calamari Festival in Monterrey. And Penny Tibbetts contributed $50 to the Club Foundation and $50 to the Club for her second-hand recognition generated by her son, Harrison “Jack” Tibbetts, being featured in a big Page One story written by reporter Derek Moore and featured in last Sunday’s Empire section of the Press Democrat. Jack was featured for waging a state-wide political battle against a formidable foe: Big Oil, working to get 500,000 signatures to qualify the California Modernization & Economic Development Act for the November 2014 ballot. Penny ‘fessed up and paid for the honor, just like a proud mama! President Bill wrapped up his personal fund-raiser, revealing that Jock McNeill, Rick Allen, and Ann Gospe were really close to receiving their Paul Harris Fellowships and told them it would be really nice if they would wrap up their $1,000 contributions to their individual fellowships while he was still Rotary President. Jock donated his final $100, Rick his last $200, and Ann, $125 to complete her relatively new fellowship. Can you answer this question from the June issue of “The Rotarian”? Tony Clark, an IT entrepreneur and 1992 Rotary Youth Exchange student funded an organization that changes people’s lives. What is the name of this non-profit organization? Jeff Gospe Introduced the Rotary Group Study Exchange Team that has been visiting District 5130 from France’s Rotary District 1700 for the past month, wrapping up their visit here in Sonoma County this weekend. Jeff reminded us that this Rotary program began more than 60 years ago, in 1949. This year’s GSE team is from the Toulouse and Montpellier areas of Southern France and Andorra. Team leader Lionel Lainard gave us a video tour of their area of France known for aeronautics, space, and its universities. It is the home of a major cancer research center and common causes that receive support, including research into brain disease, blood drives, and the local food banks. This region of France is known for the Canal Midi, a well-known major waterway across the country, the spectacular Pyrenees Mountains, the ancient city of Lourdes, and rugby. The district contains 89 Rotary Clubs and 11 Rotoract Clubs. Emmanuelle Delon works as an information technology manager. She is 38 years old and has two children—Thomas & Mathilde. Jesus Diaz is a 32 year old physician who specializes in anesthesiology and intensive care. He has developed a medical encyclopedia for the iPhone. His favorite hobby is improvisational theatre. Jerome Marty is a security engineer for information technology systems. 32 years of age, he enjoys his free time dancing and working on classic automobiles. He belongs to a Porsche Club and drives an old Citroen that he (and his mom) built. Sophie Guerandel belongs to the local Rotoract Club and will be their president next year. She is a 25 year old litigate attorney employed by the Federal Union of Consumers representing consumers in their claims against business corporations. Sophie loves travel, diving, and hiking. Lionel Lainard has his own business as a business consultant, coach, and talent development. He mentioned that his dad owns a pet pig. He likes to tango and play music and he also does improvisational theatre. Our young French .visitors concluded their presentation with a series of trivia questions about La Belle France. We eagerly participated through a show of hands that revealed anonymously our international awareness of their mother country. Or not. I think we all did pretty well!